An excellent production of Jon Robin Baitz’s Other Desert Cities has just closed at the Grand Theatre. When you see a production like this – so well acted, directed and designed and so well received by the audience – you wish the Grand would not be so reticent about programming more serious plays per season since it can present them so well. 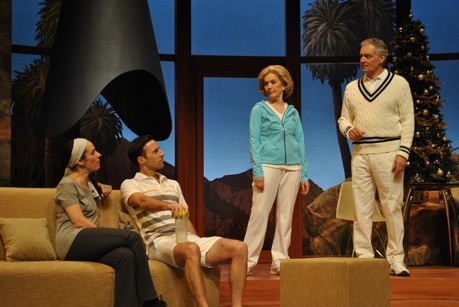 Baitz’s 2011 play is set in the expensive home of Lyman and Polly Wyeth in Palm Springs, California around Christmas 2004. Lyman (Robin Ward) started out as a film actor best known for his roles in westerns before he went into politics as a Republican and was made an ambassador. Polly (Deborah Kipp) used to write screenplays for the movies with her sister Silda (Ingrid Blekys) and they were best known for the “Hillary” series of the 1960s which sounds rather like the “Gidget” movies. Both Polly and Lyman are now retired but both are still active in the GOP. Silda is on the other end of the political and social spectrum and has just been released from rehab for alcoholism. Already ensconced in the family home is the Wyeths’ son Trip (Greg Gale), a television producer whose latest show has people present real legal cases which are then judged by a jury of once-famous low-level “stars”. Into this home dedicated to entertainment, comes the Wyeths’ daughter Brooke (Adrienne Gould) after an absence of six years. She has published nothing since the one novel that made her name. Her family has been worried about her ever since she suffered a major episode of depression that resulted in her being hospitalized. They are all happy for her now because she has finished a new book and brought it with her to show her family. Family-gathers-secrets-come-out is one of the most overused plots in American drama although it has produced such great works as Eugene O’Neill’s Long Day’s Journey into Night (written 1942), Arthur Miller’s All My Sons (1947) and Tracy Letts’ August: Osage County (2007). Baitz’s play is not quite in that category. The language never achieves the poetry of O’Neill or Miller or the outrageousness of Letts. Baitz is also too content to repeat information about his characters rather than develop it so that we really don’t know as much as we should about Trip and Silda to see how their life stories mesh, or do not, with those of the other characters. Nevertheless, Baitz does pull a significant twist on the old formula. He lets the family secret out of the bag very near the beginning of the play. As it turns out, Brooke has not written a novel but a memoir and her memoir focusses particularly on her older brother Henry, whom no one talks about. During the Vietnam War, Henry associated with leftist groups and was implicated in the bombing of a recruiting centre that left one man dead. After this, Henry apparently committed suicide by jumping off a ferry heading from Seattle to BC. Broke’s view is that Polly and Lyman’s right-wing views pushed Henry to such an extreme as did their refusal to help him after the bombing. Baitz thus changes the main question of the play from “What secret will come out?” to “Should this secret come out?” Should Brooke feel more responsibility to her parents’ reputation while they are alive or to her need to give a voice to her brother’s story? Does a person have a responsibility to tell the truth even if it makes the lives of those who love you intolerable? With the knowledge that the Iraq War is happening in “other desert cities”, the Wyeths’ debates about the benefits of hiding or releasing information take on a national historical resonance. Baitz captures the mixture of humour and seriousness in the way that real people interact with an especially good knowledge of how family members react to each other according to ingrained patterns. The most interesting strategy he used is to have us immediately side with the liberal Brooke against her arch-conservative parents and with Silda against her assimilationist sister. Both Silda and Polly are Jewish, but Polly only thinks of herself as Texan now and after marrying Lyman, suppressed her Jewish background. The fact that she and her family are celebrating Christmas is a testament to how successful she has been in taking on a new identity. Polly is in some ways a more extreme version of her actor husband, who like their friend “Ronnie” Reagan, could play the role his party needed. Baitz thus sets up Brooke as the truth-teller versus her parents the hypocrites. Brooke has Silda on her side, but Trip sits on the fence. Ultimately, the “truth” is far more complicated than it seems at first. Silda, who helped Brooke with background information was not an unbiased observer of events. And, indeed, Brooke and Silda’s knowledge of the past is incomplete because Lyman and Polly deliberately made sure it was. Baitz mentions the polarization of left and right in America, and in his play he shows how that can happen just within a family. Brooke and Silda are biased against Brooke’s parents and they are biased against Brooke and Silda. They all love and care about each other, but as soon as one side begins to deny the complexity of the thoughts and feelings of the other, the sides move farther apart. The point of the play is to show that we are as guilty as Brooke and Silda in denying the complexity of Lyman and Polly’s motives. Director Ferley has drawn fine performances from the entire cast. Her main achievement is to make the cast look and sound like a real family. Adrienne Gould stands out for her multilayered portrayal of a young woman who seeks affirmation from her parents but has privately prepared herself for their disapproval. She conveys the difficult sense that Brooke is someone who once was fragile but is no longer even though the struggle against her parents, especially against Polly seems to be taking a psychological toll. She instantly wins the audience’s sympathy as someone we don’t want to see hurt, but who has wandered into an arena where hurt seems the only outcome. Deborah Kipp masterfully plays her most powerful adversary. If Gould’s Brooke exudes warmth, Kipp’s Polly emanates iciness. Her Polly may say she loves her children but it often has the ring of duty rather than conviction. At the same time Kipp suggests that Polly’s coldness is the result of using all energy not to give in to emotion as if emotion itself were too painful for her. Her spouting of right-wing cant also suggests less her beliefs than an attempt to keep her children and her sister distant from her. In Lyman, Robin Ward portrays a man completely averse to conflict who, as a result, comes across as duller and less powerful than his wife. Ingrid Blekys and Greg Gale both make the most of their underwritten parts. Blekys brings a wonderful quirkiness to Silda, but we wish Baitz told us more why she and Polly fell out and what is the root cause of her alcoholism. Gale ably shows a son awkwardly caught between love for his parents and love for his sister. Baitz has Trip briefly give a list of his problems and suggests he is at bottom unhappy, but, as with Silda, we wish he would tell us more. Bill Layton has designed an impressive living room set that conjures up high-end southwestern style. The back of the room is floor-to-ceiling window with a glass door in the middle. Stage right of the door we see boulders just outside the windows. Stage left of the door, however, Layton has the boulders as if a lava flow had invaded the house and cooled in the room. It is an insightful non-naturalistic touch that echoes how Polly and Lyman’s pristine world was invaded from the outside by Henry politics in the 1970s and how it is invaded again in the 2000s by Brooke’s memoir. Louise Guinand’s lighting subtly creates the look of light in desert air while also highlighting the changes of mood within the family. Baitz’s play may not be one of the great American family dramas, yet it does ably capture the fraught mood of a particular time and place and the complexity of familial interactions. The Grand Theatre production shows off the play in the best possible light while showcasing the talents of a cast of fine actors. After seeing the Grand production, you would find it difficult to imagine how any company anywhere could do any better. Photos: (from top) Adrienne Gould and Ingrid Blekys; Adrienne Gould, Greg Gale, Deborah Kipp and Robin Ward. ©2014 Mike Hensen.